With the announcement of Yahoo's newest CEO, there's been a lot of talk about whether or not women can truly "have it all". I suppose some of it may depend on your definition of "having it all". Is it possible for a woman to have a successful career and still be a good mom? Yes, I believe that it is. But the truth is I don't think anyone can truly have it all, male or female. 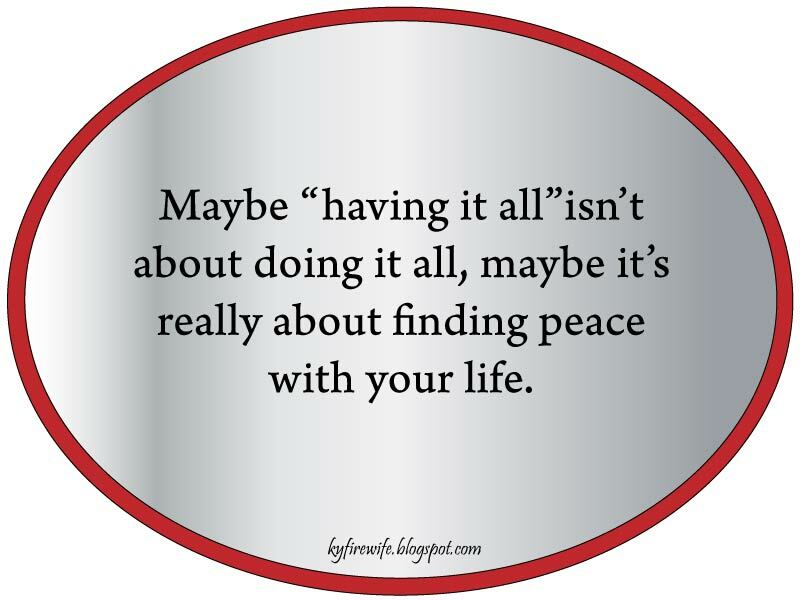 There will always be choices to make, items to prioritize, things that fall by the wayside. You make a choice. You decide what your priority is, and why. And you have to be good with that. Whether you are working because you have to, or because you want to, it's all about choices. And no matter what yours is, you have to reach a point in your life where you are at peace with the decisions you're making. It doesn't mean you won't feel the tug from one side or another on occasion. Or every day. It just means that you know why you're doing what you're doing, and you're good with that. I've written on here before about how much I struggle being a working mom. The truth is I love being a mom. Love it. Believe it is my calling in life. But I also like my job. For the most part I enjoy the work that I do, and I enjoy working with the people that I do. I also make decent pay, and have great benefits. Due to recent organizational changes, there is a pretty good opportunity to begin climbing the corporate ladder. We have multiple positions to fill, new groups to create. I have the qualifications to fill more than one of thoes. It would be a promotion, more money, and even better benefits. FireMan thinks I should try. The truth is, each of these postions requires greater responsibility than I have now, each of them has the potential for anywhere from 5%-80% travel, they all require overtime, and most of them will deal regularly with critical issues. I have seen people in these positions go on one-night trips, only to have to stay for a week. I've seen these people jump up from their seats at the office, to go home & pack a bag because they have to leave right now. It doesn't happen often, but it happens enough to not be weird. While my children are young, and as long as my husband has a job with shifts where he is gone overnight, I cannot in good conscious be in one of those positions. There's a reason where the vast majority of the members in our group have spouses who stay home with the kids. It's not just a luxury, it verges on necessity. Do I have a desire for greater responsibility? Yes. Would I like to travel for work? Yes. Do I have interest in their areas of expertise? Yes. Do I think I have the capability to do their jobs? Yes. Right now, motherhood comes first. Okay, not right now, but always. But right now, I have a young child at home, and because I make her my priority, I could not be successful in a position which required so much of me. Could I do a good job at that position? Not at the moment. At least not up to my own standards. Are there other positions open within the company that might not be so difficult to transition to? Possibly. But I'm not looking. Er... rather, I'm looking for future possibilities. Areas I'm interested in, jobs I would like to have. Someday. And I've told my supervisor that I'd like to transition to more project work, more responsibility. I've told him that I would be looking for a promotion in a few years. I'm making a choice. I am a working mom, but I am choosing to be home with my child every night. I am choosing not to regularly leave her at preschool for 10+ hours a day. I am choosing to not subject her to the instability of both of her parents performing critical jobs that could alter her daily life at any moment. I am choosing to stay in a job with less responsibility, so that I have the wherewithall to dedicate myself sufficiently to my tasks, and can do my job well instead of doing poorly at a job with greater responsibility. At this rate, It's highly unlikely I'll ever be the CEO. If I happen to stay here for the remainder of my working career, at this stage in the game I'll likely never be higher than a Manager, and that would be pushing it. 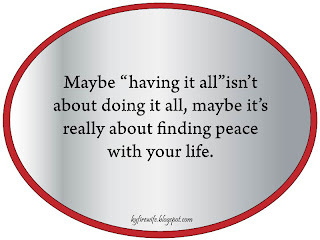 Maybe that's what "having it all" is really all about. Or maybe it should be.